Marie Curie was long idealized as a selfless and dedicated scientist, not entirely of this world. 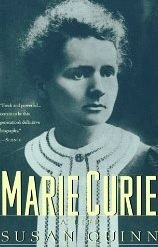 But Quinn's Marie Curie is, on the contrary, a woman of passion — born in Warsaw under the repressive regime of the Russian czars, outspokenly committed to the cause of a free Poland, deeply in love with her husband Pierre but also, after his tragic death, capable of loving a second time and of standing up against the cruel, xenophobic attacks which resulted from that love. This biography gives a full and lucid account of Marie and Pierre Curie’s scientific discoveries, placing them within the revelatory discoveries of the age. At the same time, it provides a vivid account of Marie Curie’s practical genius: the X-Ray mobiles she created to save French soldiers' lives during World War I, as well as her remarkable ability to raise funds and create a laboratory that drew researchers to Paris from all over the world. It is a story which transforms Marie Curie from an bloodless icon into a woman of passion and courage.